Journal of Materials Chemistry C, 5(5), 1033-1041 (2017). DOI: 10.1039/C6TC04360G (Published (web) 29 November 2016). 裏表紙に採用されました！(5(5), 1261-1262 (2017)) Abstract: A method for producing Cu films with low resistivity, based on low temperature sintering, is demonstrated. The Cu inks for preparing conductive Cu films consisted of Cu particles that were coated with a decomposable polymer (poly(propylenecarbonate), PPC) as well as a self-reducible copper formate/1-amino-2-propanol (CuF–IPA) complex as an additive. The sintering temperature used in this study was as low as 100 °C. Following sintering at a temperature of 100 °C, the lowest reported resistivity (8.8 × 10−7 Ω m) was achieved through the use of Cu-based metal–organic decomposition (MOD) inks. This was due to the dual promotional effects of the aminolysis of PPC with IPA and the pyrolysis of the CuF–IPA complex. Bulletin of the Chemical Society of Japan, 90(3), 279-285 (2017). DOI: 10.1246/bcsj.20160333 (Published (web) 25 November 2016). Abstract: Au/Pd alloy nanoparticles (NPs) were successfully synthesized using HAuCl4, H2PdCl4 and α-thioglycerol as a precursors and a stabilizer, respectively, by microwave induced plasma in liquid process (MWPLP). After only several minutes of microwave irradiation, metallic NPs were obtained in aqueous environment without any reducing agent. The reduction mechanism of metal ions was confirmed by UV-vis spectral changes. The results from HAADF-STEM and EDS defined that synthesized NPs were bimetallic Au/Pd. Moreover, XRD patterns of synthesized NPs implied that the composition of bimetallic NPs could be controlled by changing initial ratio of metal precursors. Abstract: A modified magnetron sputtering technique using pentaerythritol tetrakis(3-mercaptopropionate) (PEMP) as a stabilizing agent and liquid dispersion medium was developed to generate photoluminescent copper nanoclusters. The results reveal that, over time, the as-prepared blue-emitting copper nanoclusters were converted to red-emitting copper sulfide nanoclusters. The formation of copper oxide as an intermediate during the conversion of copper to copper sulfide nanoclusters was demonstrated. Furthermore, based on the mechanism of formation of copper sulfide, the kinetics of the conversion process could be controlled via ultraviolet (UV) irradiation of the as-synthesized dispersion. 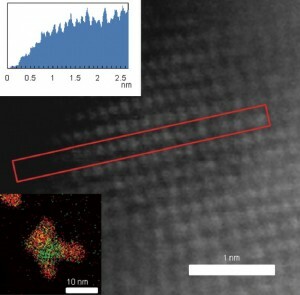 These findings shed light on the formation and conversion of nanoclusters obtained via sputtering into liquid, demonstrating that the method is highly versatile for producing metal nanoclusters and compounds with tailorable composition and optical properties. RSC Advances, 6(107), 105030-105034 (2016). Abstract: For the first time, magnetron sputtering of copper onto liquid was investigated for the preparation of stable blue-fluorescent copper nanoclusters. The fluorescent intensity increased linealy with an increase of mercaptan. Our finding sets light on the formation mechanism of metal photoluminescent nanoclusters via sputtering onto liquid. ACS Photonics, 3(11), 2184-2190 (2016). Abstract: Hard X-ray generation up to 15 keV (∼1 Å) from Au nanoparticle suspensions was systematically investigated for different particle diameters ranging from 10 to 100 nm with a narrow size distribution of ±2%. Scaling law of X-ray generation is close to a 6-photon process before the onset of saturation for excitation by 40 fs laser pulses with central wavelength of 800 nm. This is consistent with bulk plasmon excitation at λpbulk ≃ 138 nm. The longitudinal E-field component due to nanoparticle focusing is responsible for the excitation of the longitudinal bulk plasmon. The proposed analysis also explains X-ray emission from water breakdown via an electron solvation mechanism at ∼6.2 eV. The most efficient emission of X-rays was observed for 40 ± 1 nm diameter nanoparticles which also had the strongest UV extinction. X-ray emission was the most efficient when induced by prechirped 370 ± 20 fs laser pulses and exhibited the highest intensity at a negative chirp. New Journal of Chemistry, 40(11), 9337-9343 (2016). 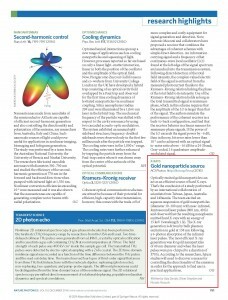 Abstract: A transparent resin containing titanium oxide nanoparticles (NPs) was prepared using a molten matrix sputtering (MMS) technique. The low vapour pressure of the liquid, pentaerythritol ethoxylate (PEEL) substrate permits the use of this vacuum technique directly with liquid PEEL under stirring conditions in order to obtain uniform dispersions of NPs. We found that it is possible to synthesize titanium oxide, TiOx, NPs with diameters of less than 5 nm with a controlled composition by simply adjusting the sputtering atmosphere. Furthermore, as the electronic structure of the TiOx NPs changes depending on the particle size, crystallinity and degree of oxidation, we were able to modify the optical properties of PEEL and the resin by embedding TiOx NPs in the matrix. The enhancement of the refractive index of a resin containing TiO2 NPs was also demonstrated. This synthetic method is promising for the advanced preparation of high purity TiOx NPs without using a reducing agent and leaving by-products for various applications in optical devices, energy conversion, and light harvesting in the UV visible region. The Journal of Physical Chemistry Letters, 7(19), 3718-3722 (2016). Abstract: Although many thiolate-protected Au clusters with different numbers of Au atoms and a variety of thiolate ligands have been synthesized, to date there has been no report of a fully cationized Au cluster protected with cationic thiolates. Herein, we report the synthesis of the first member of a new series of thiolate-protected Au cluster molecules: a fully cationized Au25(SR+)18 cluster. Optics Express, 24(18), 19994 – 20001 (2016). DOI:10.1364/OE.24.019994 (Published 12 August 2016) Open Access Paper Abstract: Femtosecond laser-induced hard X-ray generation in air from a 100-μm-thick solution film of distilled water or Au nano-sphere suspension was carried out by using a newly-developed automatic positioning system with 1-μm precision. By positioning the solution film for the highest X-ray intensity, the optimum position shifted upstream as the laser power increased due to breakdown. Optimized positioning allowed us to control X-ray intensity with high fidelity. X-ray generation from Au nano-sphere suspension and distilled water showed different power scaling. Linear and nonlinear absorption mechanism are analyzed together with numerical modeling of light delivery. Bulletin of the Chemical Society of Japan, 89(10), 1230-1232 (2016). 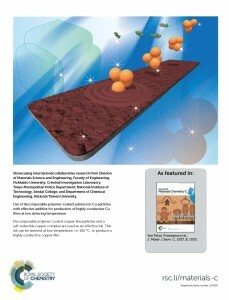 Abstract: Water-dispersible palladium nanoparticle catalysts have been prepared using palladium-carbon covalent bonds. They worked as an excellent catalyst for Suzuki-Miyaura coupling reaction in water. Even though the particle size of Pd nanoparticles was much larger than the previously reported ones, they showed a very good catalytic activity for the coupling reaction. Scientific Reports, 6, 29928 (2016). DOI: 10.1038/srep29928 (Published on line 18 July 2016) Open Access Paper Paper Abstract: Here we report a novel physical approach for thiolate–protected fluorescent gold nanoparticles with a controlled size of the order of a few nanometers. This approach is based on a sputtering of gold into a liquid matrix containing thiolate ligand as a stabilizer at various concentrations, thus no reductant was used. The size of the gold nanoparticles was successfully controlled to range from 1.6 to 7.4 nm by adjusting the thiol concentrations. Surface plasmon absorption was observed in larger nanoparticles, but it was not observed in smaller ones. Such smaller nanoparticles fluoresced at around 670 nm with a small spectral shift according to their size, however, the diameter (1.6–2.7 nm) was very strange to show such red emission compared with photophysical characteristics of reported gold cluster or nanoparticles synthesized by chemical method. 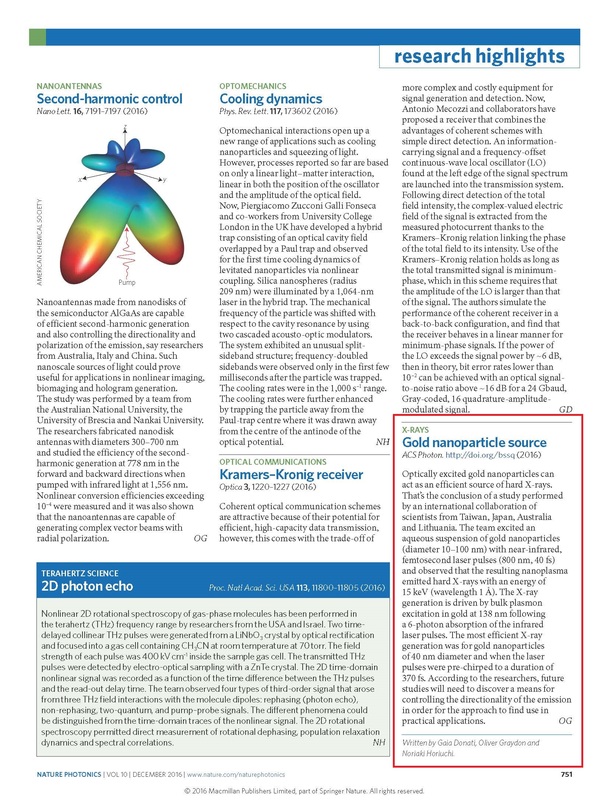 By detailed investigations using TEM, HAADF-STEM, XPS, and TGA, and size fractionation by size exclusion chromatography, we finally arrived at the plausible mechanism for the origin of unusual fluorescence property; the obtained gold nanoparticles are not single-crystal and are composed of aggregates of very small components such as multinuclear gold clusters or complexes. Optics Express, 24(15), 17050-17059 (2016). Abstract: Strong absorption of femtosecond laser pulses in Au nano-colloidal suspensions was used to generate coherent ultrasound signals at 1–20 MHz frequency range. The most efficient ultrasound generation was observed at negative chirp values and was proportional to the pulse duration. Maximization of a dimensionless factor A ≡ αc0tp defined as the ratio of pulse duration tp and the time required for sound at speed c0 to cross the optical energy deposition length (an inverse of the absorption coefficient α) given by 1/(αc0). Chirp controlled pulse duration allows effective enhancement of ultrasound generation at higher frequencies (shorter wavelengths) and is promising for a high spatial resolution acoustic imaging. Abstract: Enhanced photoacoustic (PA) intensity from gold nanosphere and nanorod colloidal suspensions in water under tightly-focused femtosecond pulsed laser irradiation was systematically investigated. PA signal amplitudes were measured by ultrasound transducers at frequencies of 5, 10, and 25 MHz. The experimental results revealed a linear-dependence of the relative photoacoustic amplitude on the laser power and the mechanism was attributed to non-radiative relaxation dynamics of surface plasmon oscillations. When gold nanorod with longitudinal absorption/extinction peak at 800 nm coincides with the wavelength of femtosecond laser pulses, the most efficient PA signal is generated. Laser excitation was kept within a thermal stability region of gold nanoparticles, i.e., colloidal suspension can be continuously reused for PA generation. Bulletin of the Chemical Society of Japan, 89(9), 1054-1056 (2016). Abstract: Sputtering deposition of gold over a liquid matrix containing different ligands resulted in the formation of gold nanoparticles, and the particle diameters gradually decreased from 6.7 to 2.1 nm as the affinity of the ligands for Au increases. Colloids and Surfaces A: Physicochemical and Engineering Aspects, 504, 437-441 (2016). Abstract: We report detailed aggregation mechanisms of sputtered silver nanoparticles in a viscous thiolate liquid matrix. Fluorescent silver nanoparticles were prepared by the sputtering deposition over pentaerythritol tetrakis(3-mercaptopropionate) (PEMP). The dependences of extinction, fluorescence and particle size on time were discussed in terms of two possible aggregation mechanisms. The main aggregation process was secondary aggregation, with primary aggregation (core coalescence) making a small contribution. The four thiol groups in the PEMP structure are the driving force determining the predominance of secondary aggregation. Finally, we successfully prepared a thiourethane resin by the polymerization of a thiolate matrix, and complete immobilization of nanoparticles in the resin resulted in no observable degradation of the photophysical properties. The demonstrations presented here will be beneficial in understanding the detailed aggregation mechanism and optical properties of nanoparticles. Nanoscience and Nanotechnology Letters, 8(4), 329-334 (2016). Abstract: In this study, we investiagetd the effects of the topological properties of ceramics nanoaprticles (NPs) (i.e., TiO2, Fe2O3, and CuO) on their biocompatibility. In the case of particle size, cell viability was not affected by the size of TiO2 particles even when the size was varied from 30 to 250 nm. Although the cytocompatibilities of TiO2NPs with different morphologies were compared, no substantial difference was observed. In the case of Fe2O3, the viability decreased slightly with increasing particle concentration without a particle-size effect. In contrast, the viability upon exposure to CuO NPs decreased drastically with increasing NP concentration. Furthermore, the viability improved when CuO NPs size was increased from the nano-regime to micro-regime. Interestingly, greater viability was exhibited by gelatin-coated Cu NPs than by CuO NPs. These results suggest that the cytocompatibility of ceramics NPs is more strongly affected by chemical species than by particle size and morphology. Colloids and Surfaces A: Physicochemical and Engineering Aspects, 498, 106-111 (2016). Abstract: A sputtering deposition of metals over liquid matrixes has been investigated as a novel and environmentally friendly method to generate stable colloidal metal nanoparticles. 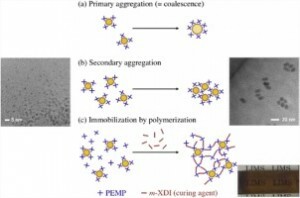 We have expanded this method by using the liquid monomers with mercapto groups in order to prepare more stable, uniform and size-controllable nanoparticles. Here we report the systematic investigation on the growth mechanism of silver nanoparticles on pentaerythritol tetrakis(3-mercaptopropionate) (PEMP) matrix under the varied viscosities controlled by temperature. 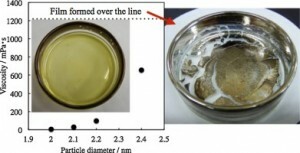 The diameter of obtained nanoparticles increased from 1.8 to 2.3 nm as the viscosity of the liquid matrix increased, and at higher viscosity region we obtained a thin deposited film on the liquid surface but no nanoparticles formed. The effect of viscosity on the particle diameter was much smaller than previous works using ionic liquids or polyethylene glycol, and then the phenomenon was understood by the structure of these matrixes where PEMP has four mercapto groups however ionic liquids or polyethylene glycol does not have any functional groups that introduce strong interaction with metals. These demonstrations suggest that the sputtering over mercaptan liquid matrix is a more favorable method for the stable preparation of uniform very small nanoparticles. RSC Advances, 6(32), 26725-26733 (2016). DOI: 10.1039/C5RA25676C (Published (web) on 07 Mar 2016). Open Access Paper. Abstract: A straightforward method for synthesizing single-crystalline SnO micro particles in an organic medium using tin acetylacetonate as the precursor and oleylamine as the capping ligand is proposed. For the first time, well-defined four-petal starfish-like SnO sheets were obtained in the organic medium. In addition, the shape of the particles could be reproducibly tuned such that their structures varied from cubes to squares and then to starfish-like sheets by simply changing the concentration of oleylamine. The underlying mechanism of this process was found to be closely related to the interaction of the stabilizing agent with the SnO crystal planes. Changing the concentration of the stabilizing agent could modify this interaction, leading to the preferential growth of certain crystal planes of SnO particles which determined the particle shape. This synthesis approach is advantageous in terms of allowing control over the particle shape as well as for its simplicity and short reaction time. Our results yield crucial insights regarding the shape evolution of SnO particles. Journal of Nanoscience and Nanotechnology, 16(9), 9257-9262 (2016). DOI: 10.1166/jnn.2016.12923 (Published on 1 September 2016) Abstract: Plasma-in-liquid process (PLP) has become a hot topic in green synthesis of metal nanoparticles (NPs). In order to overcome one of the current challenges associated with the impurity produced from metal electrodes, this study utilized a ceramic-coated electrode to prepare pure Au NPs stabilized by L-arginine. Using this electrode, the reduction of Au ions during the plasma irradiation, the formation of Au NPs, their size and size distribution as a function of the pH were investigated. Our results show that a bimodal NP size distribution was obtained at pH 3.5–12.0. The fraction of small sized Au NPs becomes significant at pH 6.0 and 12.0 while that of big sized Au NPs is dominant at pH 3.5. The results in the present study suggested that this change in the size distribution of Au NPs was governed by the reduction rate of gold ion at different pH under plasma generated in water. Journal of Materials Chemistry C, 4(11), 2228-2234 (2016). DOI: 10.1039/C6TC00161K (Published (web) on 23 February 2016). Open Access Paper. Abstract: Tin nanoparticles (Sn NPs) are of considerable interest for conductive printing because of the low melting temperature and low cost. In the present study, polyvinylpyrrolidone (PVP) stabilized metallic Sn NPs were synthesized by a polyol process; and the size of Sn NPs was controlled from 15 to 89 nm by adjusting the amount of PVP. For the first time, we demonstrated that conductive patterns fabricated from the inks of metallic Sn NPs were achieved readily at room temperature under N2 without reducing gases or additives. The lowest obtained resistivity was 1.1 × 10-5 Ω m which was 100 times higher than that of bulk Sn. The size of Sn NPs, the amount of the stabilizing agent, and the low melting temperature of Sn NPs were found as the main factors controlling the conductivity of the obtained Sn pattern at room temperature sintering. This study offered a new approach for the room temperature fabrication of conductive electronics using printing technique. Materials Letters, 171, 75-78 (2016). DOI: 10.1016/j.matlet.2016.02.047 (Published (web) on 12 February 2016) Abstract: A new approach using double target sputtering into liquid is proposed to synthesize Ag-Au alloy nanoparticles (NPs). The results reveal the formation of Ag-Au solid solution alloy as individual NPs. Variation of the applied target current allows fine tuning of the NP composition, and, therefore, variation of optical properties of the alloy NPs. The method offers highly independent control of sputter parameters for each metal target, thereby allowing manipulation of the NP composition, size and optical properties. Physical Chemistry Chemical Physics, 18(13), 8773-8776 (2016). DOI: 10.1039/C6CP00538A (Published (web) on 09 February 2016) Open Access Paper. Abstract: A novel positively charged fluorescent gold nanocluster was successfully synthesized using the shortest cationic thiol, thiocholine. Effective control of electrostatic repulsion by the introduction of an anionic surfactant afforded a nanocluster that showed blue fluorescence emission. RSC Advances, 6(15), 12048-12052 (2016). DOI: 10.1039/C5RA25058G (Published (web) on 18 January 2016) Open Access Paper. Abstract: A novel low cost sintering process of copper fine particles to a copper conductive layer was demonstrated at as low as 100 °C without reductive gas flow. Sintering of a mixture of copper particles and copper-based metal–organic-decomposition (MOD) ink gave a copper film with high packing density and low resistivity (9 × 10−6 Ω m). This novel process may open a new strategy in the field of printed electronics.